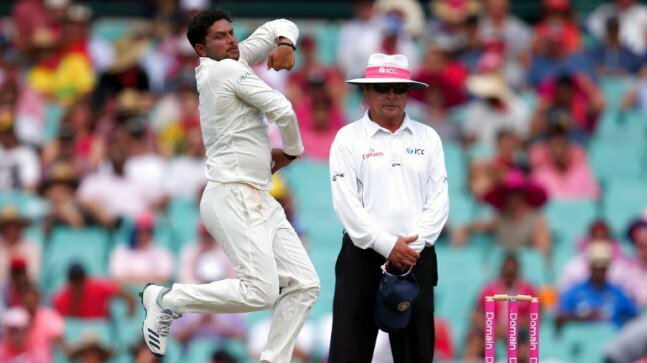 Spinners Kuldeep Yadav and Ravindra Jadeja combined and claimed five wickets between them as India moved into a dominating position at the end of Day 3 of the fourth test at Sydney on Saturday. Resuming at an overnight score of 24/0, the Australian opening pair of Marcus Harris and Usman Khawaja batted positively and took the attack to the Indian bowlers by adding 48 more runs before Kuldeep provided the much needed breakthrough by getting Khawaja caught by Cheteshwar Pujara for 26 runs. At the other end Marcus Harris continue to pile on the runs and added 56 runs with the hosts new No.3 Marnus Labuschagne before he chopped a Jadeja delivery onto his stumps. Harris had done all the hard work and his dismissal for 79 triggered a middle order collapse. Shaun Marsh had scored a century at the same venue against England last year, but could only make only 8 here before he became Jadeja’s second victim, tamely edging one to Rahane at slip. Labuschagne looked good in his innings before a brilliant reflex catch from Ajinkya Rahane at mid wicket sent him back to the pavillion for 38. The home side’s misery continued as Travis Head hit a full toss back to Kuldeep just before the tea break. Australian captain Tim Paine was the next to go, bowled through the gate after making just five, as Australia slumped to 198/6. Peter Handscomb, making a return here after having been dropped for the MCG test, batted sensibly along with pace bowler Pat Cummins and the duo saw the day through without any further damage before bad light ended play for the day, with Australia 236/6. Kuldeep Yadav was India’s best bowler as he finished with figures of 3 wickets for 71 runs, while Ravindra Jadeja claimed 2 wickets. Australia at Stumps on Day 3- 236/6 – Marcus Harris 79, Marnus Labuschagne 38 ( Kuldeep Yadav 3/71, Ravindra Jadeja 2/62).